While there was plenty of other things going on over this past Memorial day I was able to get to Ft Logan National Cemetery and pay my respects to my friend Kirk who passed away December 31, 2015 after a long bout with cancer. There is nothing quite as stirring as military cemetery. I also road my bike over to Fairmont Cemetery in Denver. There is a small military section maintained by the Veterans Administration there as well. Francis Lowry, for whom Lowry Air Force base was name, is buried there. I didn't take any pictures there so I'll follow up and add some later from Fairmont. Some of the military graves there are for veterans of the Spanish-American War. I admit that my interest in WWI is fairly narrow. While I have a number of very good overall WWI books long term blog followers know that I'm definitely focused on the USMC and its contributions to the war effort. I stumbled across a sale this week and managed to snare three almost new books to add to my collection. Two have been on my list for a while but the third had managed to escape my attention for some reason. The one I'm really looking forward to starting is: "With the Help of God and a Few Marines" by Brig Gen Albertus W Catlin, USMC[Ret]. This memoir was written by Gen Catlin in 1919 while the repercussions of the war were still spreading. Catlin was the Colonel of the 6th Marine Regiment and was wounded through the right lung during the fight. This should be an interesting read since it was written so soon after the battle for Belleau Wood. Next up is: "Miracle at Belleau Wood, The Birth of the Modern US Marine Corps" by Alan Axelrod. This one has been on my list for a while now and I can finally cross it off. This is supposed to be a really good account of the battle and it will be interesting to compare it back to Catlin's work on the subject. Interestingly enough the picture on the cover features an Army gun crew manning a 37mm gun during the short period that the 7th Infantry Regiment relieved the Marines for 5 days during the action. The last one, and one that was pointed out to me on TMP, is "Through the Wheat, The US Marines in WWI" by Brig Gen Edwin H. Summers, USMC [Ret] and Col Joseph H. Alexander, USMC [Ret]. While I think there will still be a focus on Belleau Wood this one appears to encompass most of the actions that the USMC participated in during their time in France, Belleau Wood, Soissons and Mont Blanc are all mentioned on the jacket. Looks like I will have some reading material for the next couple of weeks at least!. 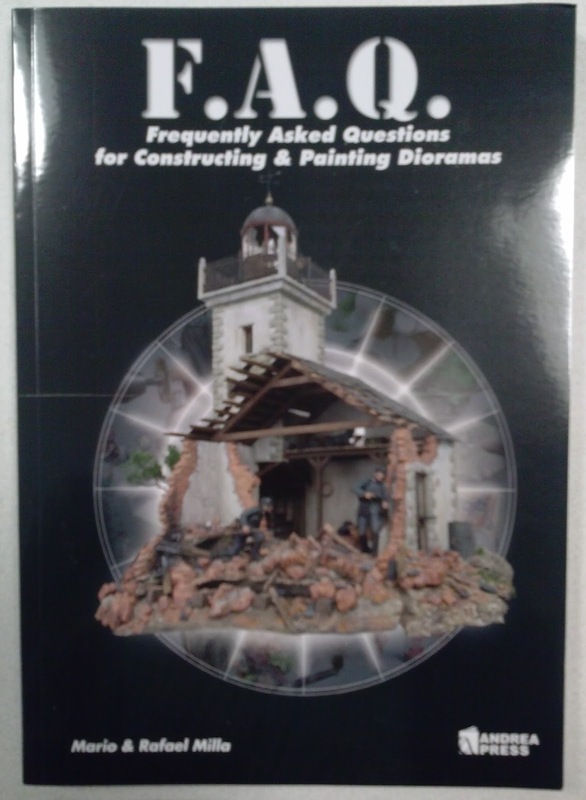 I periodically do searches for books on painting and diorama building just to try and keep up with things that I might have missed. Last week this one popped up in my searches. I own F.A.Q 1 and 2 which are primarily focused on armor modeling so when this one popped up it caught my eye. The first two were both written by Mig Jimenez the first published by Andrea Press and the second by AK Interactive. 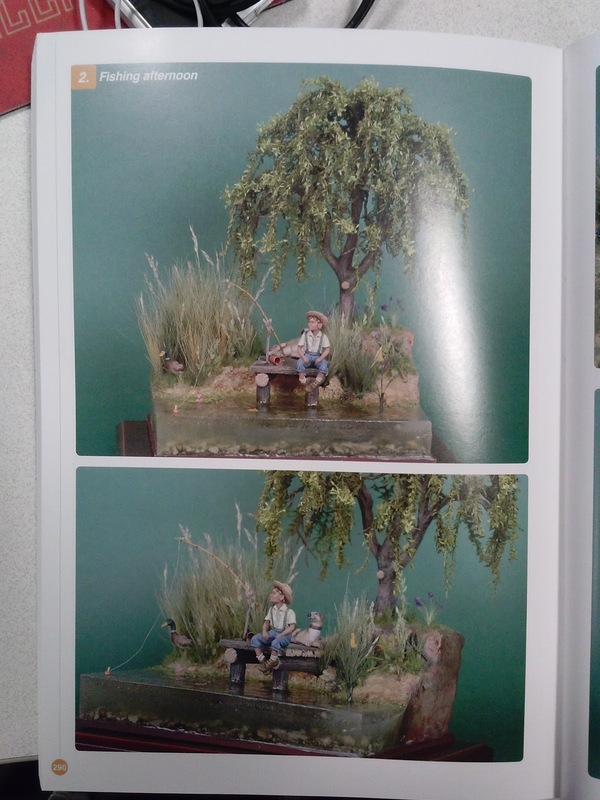 This one is by Mario & Rafael Milla and also published by Andrea Press and if you are serious about building dioramas I would put this one on the must have list, right next to Shep Paine's diorama book. Mario & Rafael try to present a very complete book and they aren't far off the mark either. While its not a true step by step book by any means they did approach by building four, essentially identical, dioramas that are used to show the seasonal variations for water and ground cover. I found this a great way to present the material. 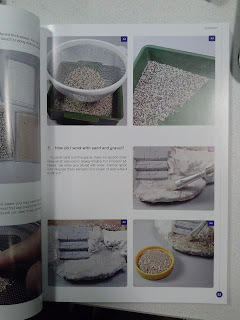 They do not limit themselves to just these dioramas though and present a vast area of very useful "how to" information. All told 311 pages of material. I was actually most looking forward to the electronics sections as I have been slowly trying to figure out the best way to do some lighting effects for my town of Calamity. While there is a ton of useful information there, it doesn't really go into some of the design detail you need to build lighting circuits, rather you have to piece everything together. It does do a fine job of describing all of those electrical components and making suggestions for the proper materials to use to for different types of lighting though, so still very useful. I think that perhaps the strongest single section is the one on vegetation. Its extensive and quite useful and provides a lot of information on how to replicate different types of vegetation with different materials. 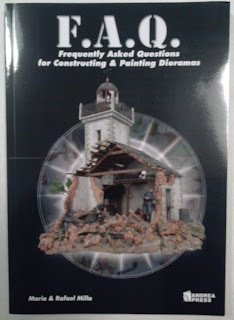 While it was a bit expensive, I found a new copy on Amazon for $60.95, I think its a great reference investment. I'm not sure but this book maybe out of print already as well. Amazon was listing used copies running in excess of $150. So if you can find a new one, I would grab it. ReaperCon is at the end of October this year, which means its only 5 months away, literally tomorrow by my ever slowing painting speed. One of my problems with painting competitions, in general, is that I really prefer the diorama category which means that there is a lot more work to be done on each entry. I'm contemplating just two entries this year. The first will be one of the Round 2 Eagles (the 12" versions not the big 22" monster) and a single vignette. The vignette will be no more than 3 minis on a very small base. I'm hoping to actually use a variation of the basing concept that I developed last year but wasn't able to actually put into play. Last year my dioramas did quite well with the "Steady Lads" receiving a gold medal and "Shopping II" receiving the Best Hasslefree Miniatures award. There are a couple of easter eggs on this one that very few people picked up on. 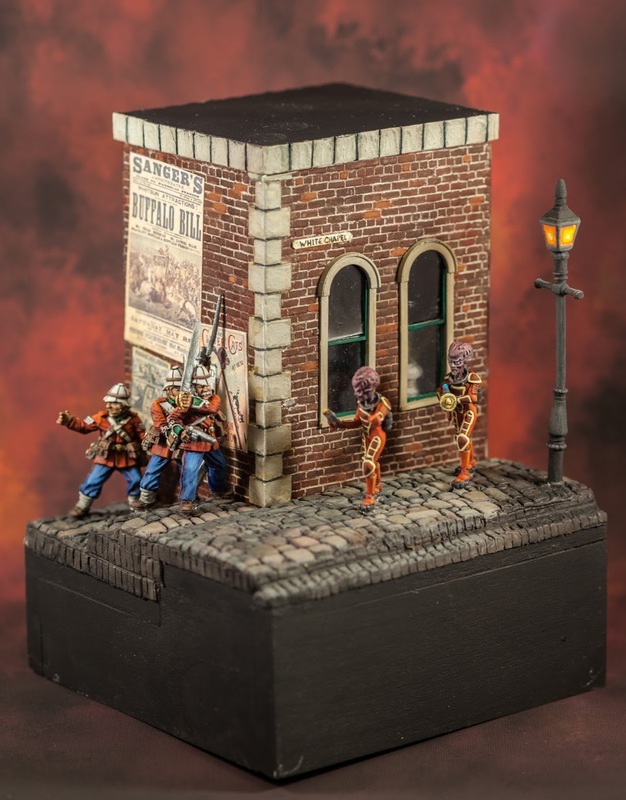 There is a rat coming out of rat hole in the building's side behind one of the soldiers and a resident in the far right hand window. My only regret on this one is not going a lot heavier with the graffiti. Quite frankly I wasn't sure I could pull it off so I kept it small, and then managed to hide most of it behind the dumpster. 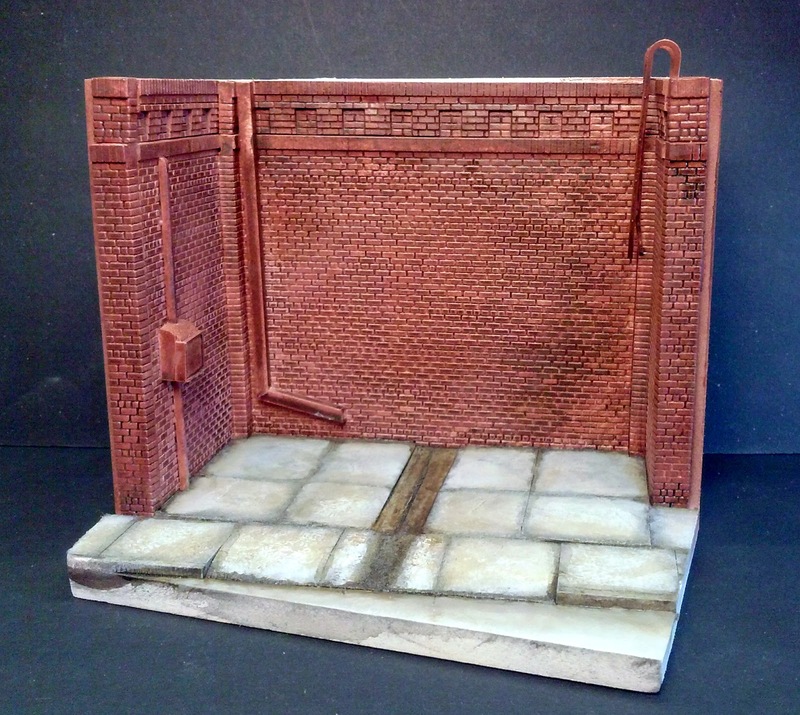 What is the difference between a diorama and a vignette? 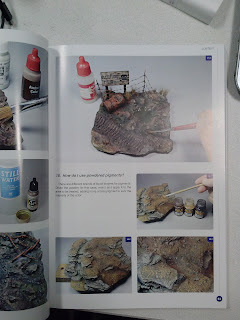 I have never really found a good definition but it seems that most vignettes are 3 or fewer figures on a smaller base, dioramas are anything larger than that. That seems pretty straightforward enough and within most competitions they are going to fall into the same category anyway. I feel like the vignette is harder to pull off effectively there are fewer elements so you need to be more precise with your story. First; the Story. Seriously this really is the key to a successfully entry. 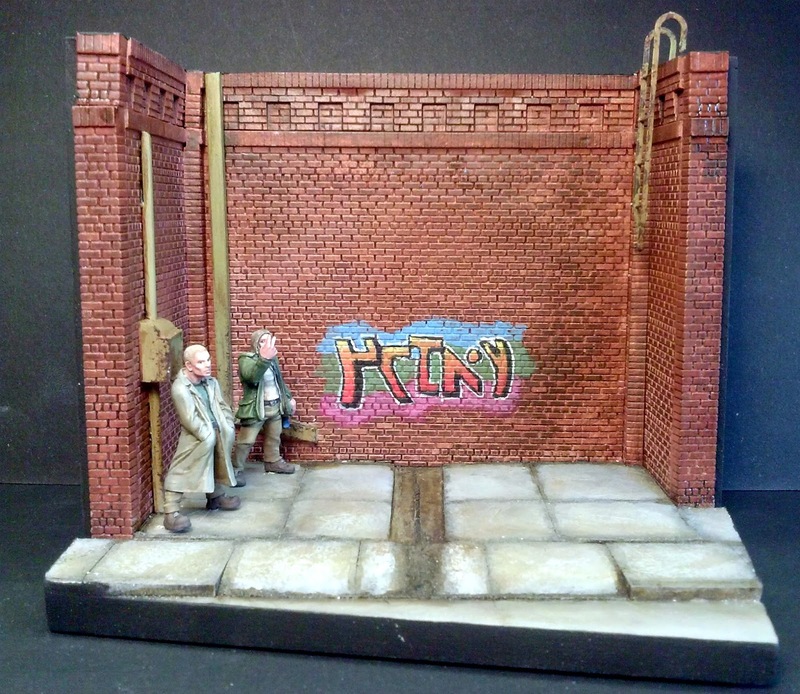 You must clearly tell your story with just the miniatures and the scene you set them in. If you have to stand there and explain it to the people that are viewing it then you have failed. Simple stories are the best but a complex story or action can also be told. There is a tendency here to add as many miniatures as possible to tell our story and if there are to many miniatures the story can be lost. Unfortunately there is no formula for this you have to make that decision on your own. Second; the Setting. 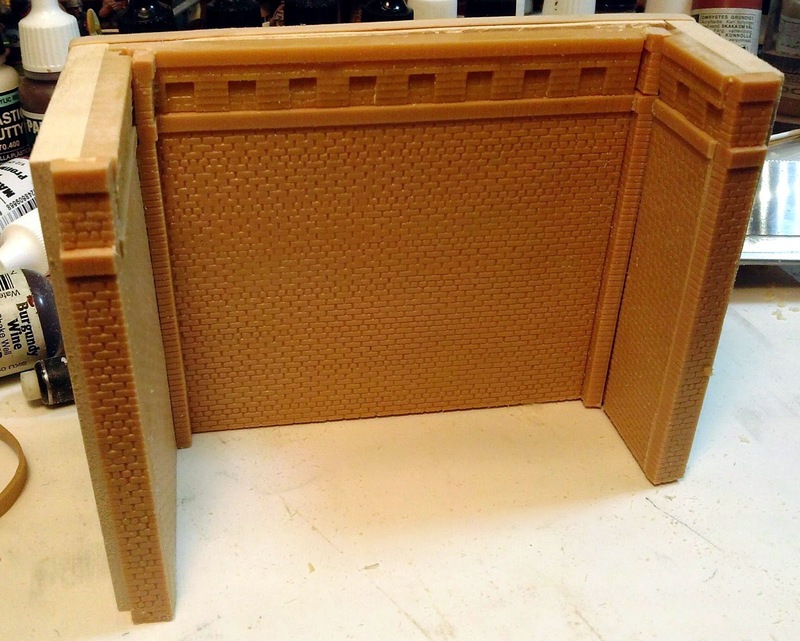 There are two main pieces to setting; time and place. 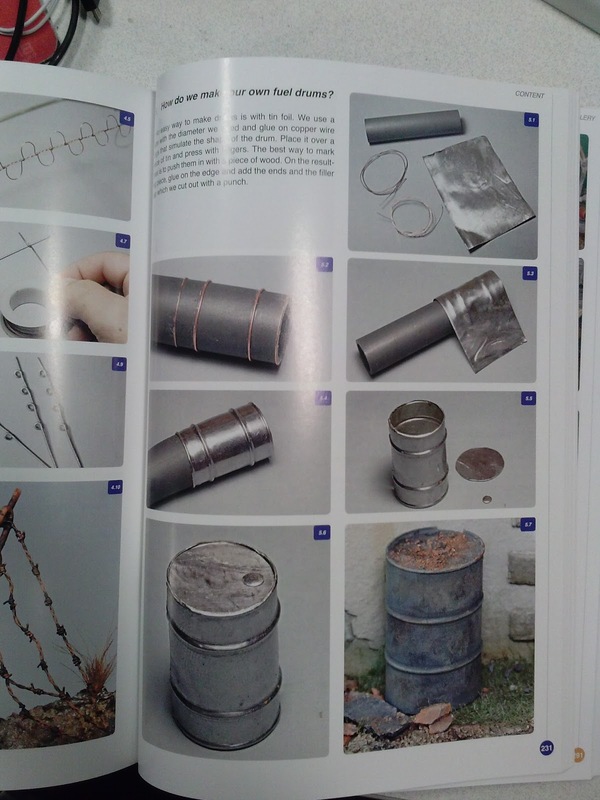 Both "Steady Lads" and "Shopping II" are urban settings and that defines the materials that I can use. Each piece has a distinct time stamp to it. By picking a time you eliminate elements that might contradict your story. For instance an electric lamp in "Steady Lads" would be inappropriate as the setting is in England about the time of Jack the Ripper when gas street lamps (and even candle powered) lamps were common. "Shopping II" is set in the future although only the minis themselves really give full credence to a futuristic setting. The only other clue is that none of the graffiti or signs are in English. Fortunately the soldiers are obviously in a period later than our own. So now you have a time and a place, how are you going to fill it? Third; Composition. 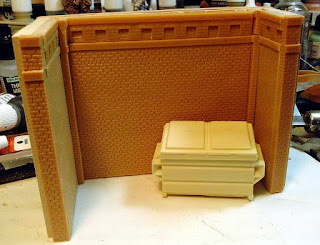 This is the make or break point for the creation of a diorama. The composition of your piece needs to draw your viewer in and move their eye from element to element to the focal point without letting the viewer accidentally leave the scene. The focal point will help establish your composition and draw all your elements together and resist putting it in the center! Looking at "Shopping II" we find that the tall red boots are the focal point of the piece. All the site lines within the piece draw the viewer into the scene and with the walls serving as large, simple view blocks, the viewer is kept within the scene. The focal point in "Steady Lads" is not as obvious. Here it is the point where the two groups are going to come into conflict so its a vague point roughly at the corner of the building where the action is going to take place. It also lacks the obvious view blocks of "Shopping II". In this case the gas lamp at the corner and the narrow space between it and the building help keep the viewer in the scene while on the left side the Sergeant is motioning "Off Set" characters into the scene which draws the viewer's eye back to the center of the piece. 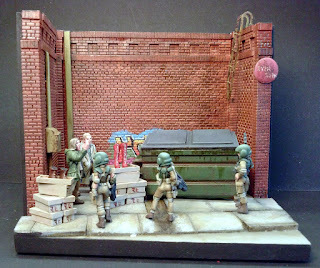 These are the elements that the judges, at least at ReaperCon, are looking for in a diorama. How well you pull these three things off will determine what kind of award you are going to receive at the awards ceremony. 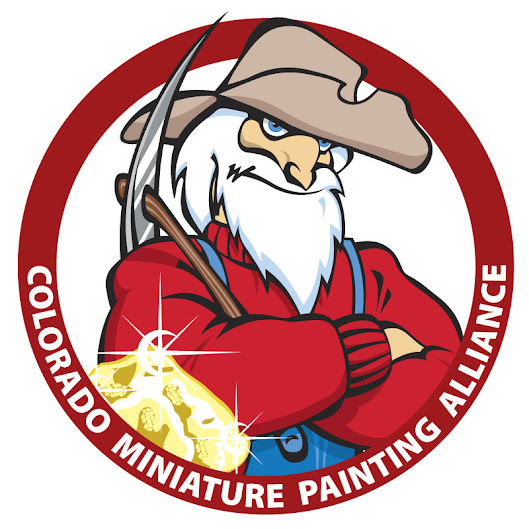 You may have heard or read about painting for the judges now you know what I consider to be important! 1) Story first! I don't start pulling anything together till I feel like I have a story I want to tell. Sometimes that's triggered by a picture, a photograph, a poster, or even a mini that I know I want to do more with than just let it stand around on a base by itself. For "Shopping II" I started by defining the space with the walls. Then added additional elements till I was happy with the space. I knew I was going to have some dead space in this diorama so I added elements like the dumpster and the piping to help fill those voids. 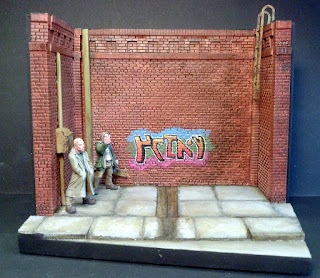 The back wall was to blank so I tried my hand at some freehand graffiti. I hid a chunk of this behind the dumpster because I felt like it was dominating the scene to much. Hiding it helped tone it down into a smaller supporting element. 3) How many minis? Usually the story tells me this. Once I have a story I start to pull minis together that I want to use, often this is a lot more than I need but I'm not sure what I want quite yet. I start adding all the minis to the mockup, its probably pretty crowded at this point. I then start removing minis one at a time. I keep doing this till the story becomes unclear, then I add back that key mini and I know I have all the minis I need to effectively tell the story. That doesn't mean there isn't a place for large dioramas with lots (even hundreds) of miniatures and lots of tiny scenes that add to the whole but time is precious and for a competition I would recommend keeping things as simple as possible. 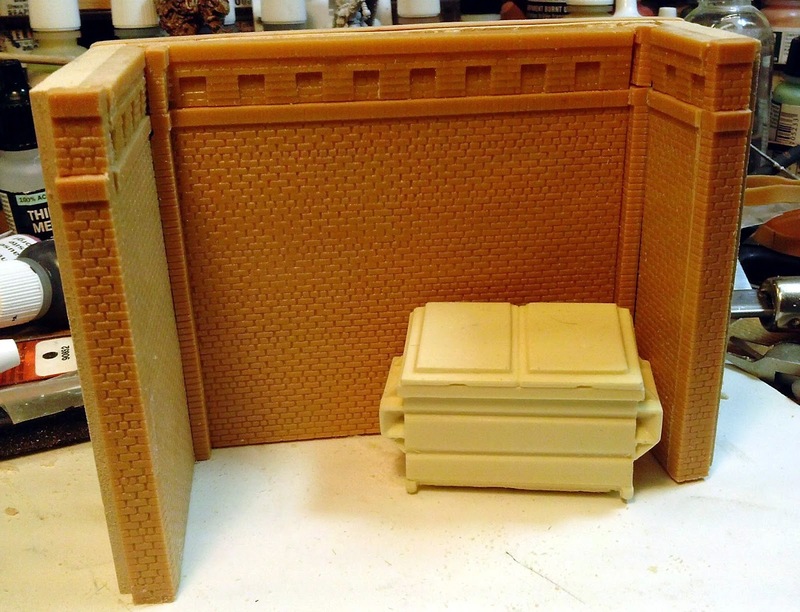 4) Avoid lines that are parallel to the edges of the diorama/vignette base. Even a small angle will help make your edge look less like an edge. "Steady Lads" is one of the only times I have broken this particular "rule". I felt that by adding in the angles I would actually distract the viewer from the scene and actually lead them right out of it. 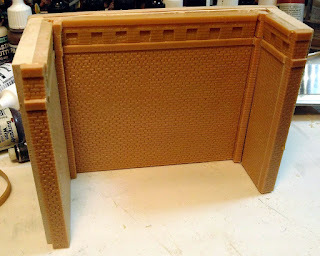 Here you can see how I angled the walls so they weren't parallel to the base. This helps keep the composition flowing from one point to the next and adds a bit of interest. 5) While a diorama/vignette still needs to be well painted, painting is somewhat secondary to the story. One of the things to remember is that, most of the time, we want the emphasis to be on the miniatures. Background elements should not vie for the viewers attention. Keep colors for secondary elements somewhat muted so that the minis dominate the scene. 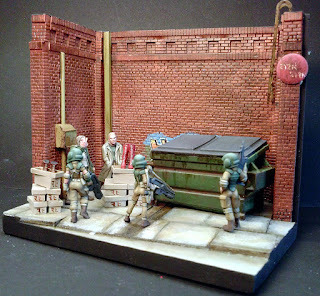 Here we can see how the background elements actually fade into the background and leave the minis as the main elements. 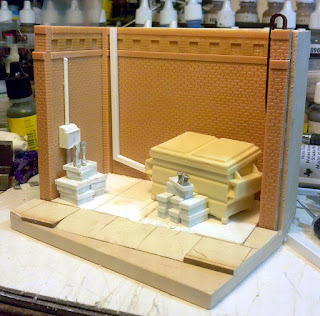 There you have it, my own personal views on building a successful diorama. There are a number of books that I would recommend as well. 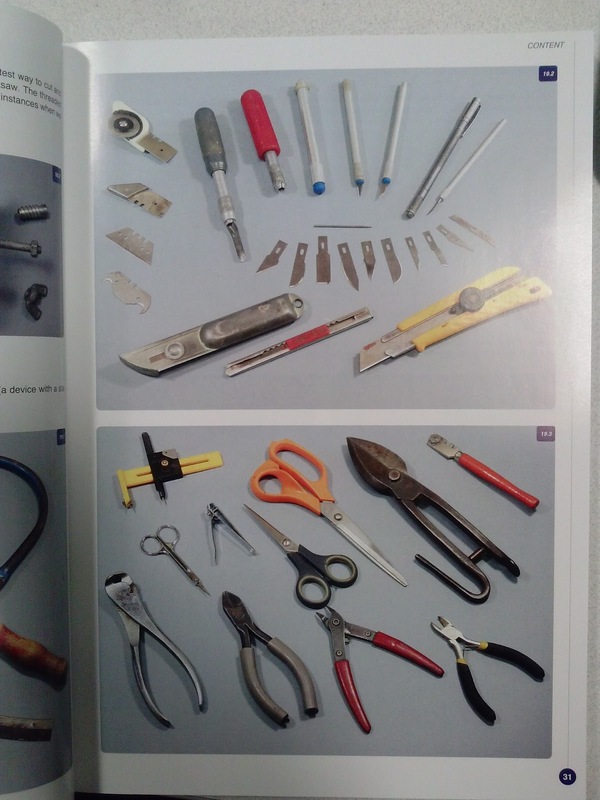 I own all of these and they are quite well thumbed through. I have even had to replace my Shep Paine book once. 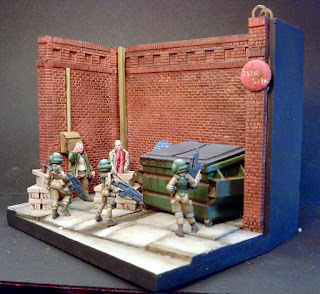 If you have other good books on dioramas feel free to mention them in the comments.